Leaving Cradle Mountain behind was rather sad, however, with only five more nights in Tasmania, there were other areas we wanted to see before departing back to the mainland on Saturday night. Stanley, situated on the on the north west coast was our next intended destination. I had heard it was a lovely place and must say it didn’t disappoint. First stop, the top of The Nut, an old volcanic plug that rises 143 metres (469.1 feet) above the town and accessible via a steep track or a chairlift. We took the chairlift. On top of The Nut, there is a 2.3 kilometre (1.4 mile) walking track that affords the most magnificent views of Bass Strait and the surrounding landscape. A northern panoramic shot taken from west to east. We visited Highfield Historic Site, regarded as the ‘birthplace’ of European settlement in Tasmania’s north west. It’s now owned by the Tasmanian Government and although a significant part of Tasmania’s history, and that of the Van Diemen’s Land Company who had a huge impact on Tasmania’s north west, it was hard to be there and look beyond the fact that, much like Port Arthur, Highfield House and all the surrounding buildings were erected by convicts. 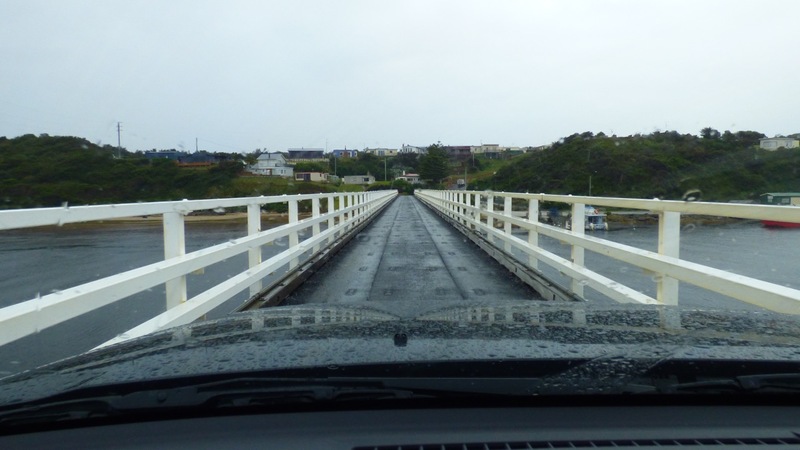 While at Stanley, we took a drive over to the west coast to Marrawah and then down to Arthur River, where we drove over the narrowest bridge I’ve ever been on – that I can remember anyway. We stayed at the Stanley Cabin & Tourist Park, a locally owned and operated award-winning tourist park and I must say, the best reception area we’ve ever seen. It was warm and welcoming, inviting us to spend time there, and this flowed throughout the park, with flowers in the bathrooms and floor mats to use after showering. Do I need to tell you how hard it can be getting dressed when the floor is wet? Little touches like that make an impression and leave you with a sense of wanting to return. The weather was not kind while we were at Stanley with that predicted low pressure system moving in and we spent one day sitting inside our mini home simply because there was nowhere else to be or go to get away from the rain and the wind. At least at Stanley, the natural formation of the surrounding hills provided some protection from the worst of the wind. We didn’t mind – sometimes it’s ok to sit and do nothing. I’d love to spend a week (or more) renting a house/cottage on the hill looking towards town and the Nut, doing absolutely nothing. Except reading. Drawing, maybe. Lots of photography. Definitely enjoying a daily walk after a nice sleep in. And maybe one again after an afternoon nap. Yep. One day. Hopefully before I retire! I’m glad you Liked Stanley, the Blue Dog Cafe is an interesting place to sit and chill out, plenty to look at there too…. might be a brown or black dog, not 100% sure. I’m surprised you didn’t walk up The Nut. We were very impressed by the bath mats at the Caravan Park too, weve never had that simple pleasure in one before.